Martin Garza, owner of La Quinta Inn and Suites on South 10th Street, addresses protesters who gathered outside his hotel Monday May 1, 2017 in McAllen. Protesters said that some workers who built the hotel were not paid for their labor, Garza told them that he paid the lead contractor and held up his end of the contract, but a sub-contractor did not pay workers. McALLEN — As people around the world came together to march in support of workers’ rights, local advocacy groups and protestors made their voices heard in the streets of downtown. About 50 people Monday marched about a mile to Archer Park through the downtown portion of the city to highlight workers’ and immigrants’ rights. But this year, with immigrant communities feeling pressure from not only the Trump administration, with his calls for deportations of undocumented immigrants, but also at the state level where the new proposed laws threaten vulnerable immigrant communities, the atmosphere surrounding the march was at a peak level. The march comes at a contentious time for many immigrant communities in the state, as the controversial SB4, a bill that if passed would give local law enforcement the authority to check the legal status of anyone in the state, makes its way to become law. John-Michael Torres, communications coordinator for La Union del Pueblo Entero (LUPE), said last week’s news has angered many in the undocumented community — saying many were emboldened to continue fighting. “The change that we’ve seen from last week to this week (is) a combination of both the fear and anxiety that comes from knowing that now, after the bill goes into effect, that police could be the face of deportation in Texas,” Torres said. Torres said the urgency among those in the immigrant community has ramped up after the news of SB4’s most likely passage was announced. “For a lot of people (the news) isn’t crippling or debilitating, but rather it’s mobilizing (us), and there’s a lot of energy for the march today because of it,” Torres said. He said the proposed bill is a ‘line in the sand’ between the immigrant communities throughout the state and those conservatives who are pushing it into law. Outside city hall Efrén Olivares, an attorney for the Texas Civil Rights Project, riled up the protestors as they made their way to Archer Park. While protestors marched toward the park, in Austin at least a handful of LUPE members, along with members from other advocacy groups, participated in a sit-in at Gov. Abbot’s office, in protest of SB4. Inside Abbott’s office several people chanted and protested against SB4, the bill that would make it an officer’s duty to check the documentation of people they suspected of being in the country without proper documentation. Norma Herrera, a Rio Grande Valley native and a former undocumented immigrant, was one of the protestors at the sit-in. Herrera expressed her support in a prepared statement for immigrants and her resolve to fight against SB4. “We are sitting in at the governor’s office because it is our moral obligation to resist unjust laws just as it was our civic duty to tell our representatives we didn’t want one to begin with,” Herrera said. “As a public servant, I worked for the very body that now wants to run me out of my state in supposed allegiance to a voluntary federal program. As a proud Texas Latina, I know that’s dog whistle for anti-immigrant hate. When our families are targeted, we will hold our elected officials accountable for our pain. Locally groups like LUPE and Fuerza, since Trump took office, have held informal know your rights’ classes, helping assuage some of the fears held by members of immigrant communities. At the meetings, those most affected by the Trump administration’s aggressive deportation campaign can at the very least know how to prepare for a likely encounter with Immigration Customs Enforcement officials. 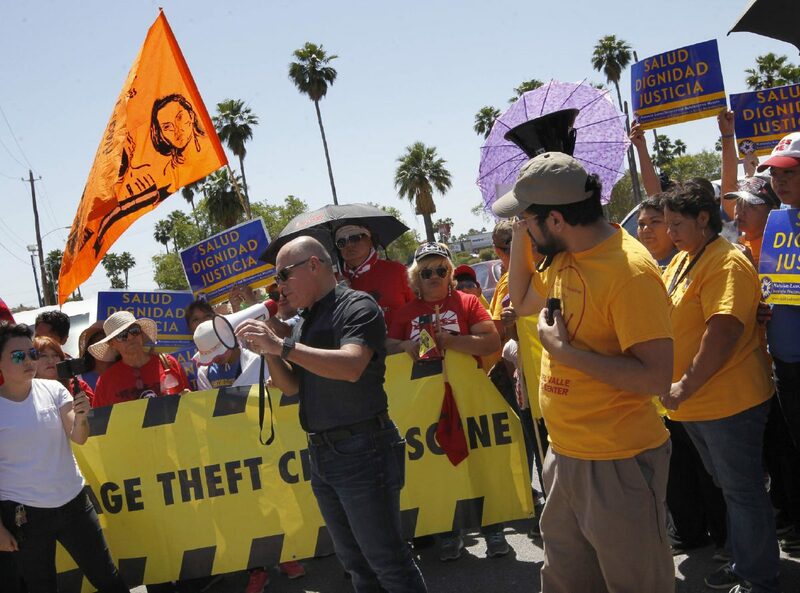 Before the march began, and just outside the La Quinta hotel where workers’ abuses have been reported, several protestors kicked off the day with an hour-long picket of the hotel. Moments later, the hotel’s owner, Martin Garza, confronted one of the protester’s organizers, Hector Guzman Lopez, coordinator for Fuerza del Valle Workers’ Center, a local immigrant-worker advocacy group. Garza was upset that the protestors began the march in front of the newly constructed building — saying he wished they understood that it was sub-contractors who they should protest, since they were the ones who failed to pay wages to multiple people who worked on the construction of the property. Guzman said he afforded several opportunities to Garza and other parties involved in the dispute but that since September, when The Monitor reported more than $25,000 in owed wages for people who worked on the hotel project, he has only heard from Garza twice — saying that Garza could have made time for them and not waited until they protested in front of his hotel. Garza, after being given a chance to address the protestors, said he is determined on coordinating with Guzman on finding an appropriate solution to the issue, and seeking criminal action against the sub-contractors involved — and the issue was resolved for the time being. Guzman said the atmosphere created by Trump’s administration nationally, and the possible implementation of a “show me your papers” type law in Texas has impacted undocumented workers, citing a rise in these types of abuses. “It’s a very dangerous time (for workers). Employers are further emboldened to abuse workers’ rights,” Guzman said.